Photo of the grave of Private Isaac Buck, DAR Patriot Index # A016453 FAG # 57135132, and his wife Sarah Hall, in Buck’s Bridge Cemetery in the Town of Potsdam NY. This cemetery is very close to the boundary of the Town of Madrid NY. 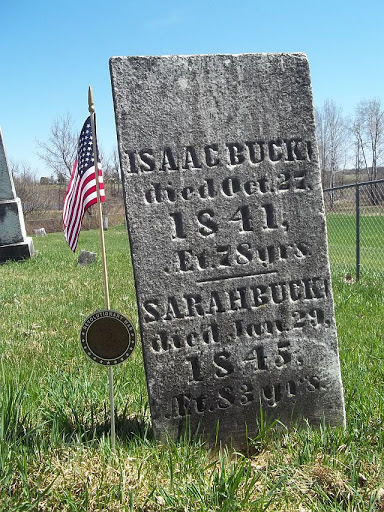 Isaac Buck resided in and served in the Revolutionary War in VT. He was born 23 May 1763 in New Milford CT, and died 27 October 1841 in the nearby Town of Canton NY. His wife Sarah Hall died 29 January 1845 at the age of 83 years. Other photos appear on Anne Cady and Find a Grave websites. Grave site marked by Jennifer Baird Bixby, Swe-kat-si Chapter NSDAR. 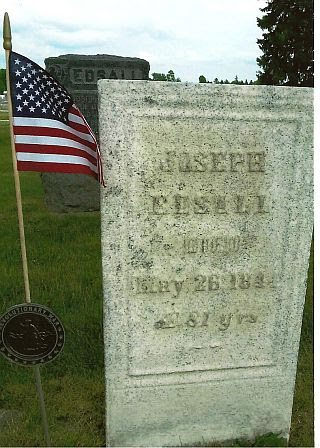 Photos of the graves of Private David Haskel, DAR Patriot #A052362 FAG# 104919223, and his first wife, Elizabeth Putnam, in the Haskell Cemetery in the Town of Madrid NY. Note that the names on the tombstones are spelled with only one “L”. His second wife, Mary More does not appear to be buried there. Other photos appear on Anne Cady and Find a Grave websites. David Haskel was born c. 1755 in Thompson CT. He died in Madrid NY on 4 January 1828. Elizabeth Putnam died 4 October 1824 at the age of 62 years. David served in the Revolutionary War in MA, CT and NH. He served under Captains Nathaniel Healey, and Carter and under Cols Ebenezer Learned and Whitney, and in CT under Captain Lyon, in NH under Captain Dustin. Photos of the grave sites of Private Jonathan Morris, DAR Ancestor #A201544 FAG# 25533317, and his wife, Hannah Lincoln, in the East Road Cemetery, DePeyster NY. Jonathan Morris was born in 1758 in Woodstock, Windham County CT, and died 25 August 1837 in DePeyster, St. Lawrence County NY. Hannah Lincoln died 26 January 1853 in the 91 year of her age. Jonathan Morris resided in Woodstock, Windham County CT and in Sturbridge, Worcester County MA during the war. He served under Ens Richard Peabody and Lt Jonathan Morris. Other photos appear on the Anne Cady and FAG websites. Grave sites marked by Jennifer Baird Bixby, Swe-kat-si Chapter NSDAR. Photo of the grave site of Private Nathan Burlingame, DAR Ancestor # A017240 FAG# 34574983, in the Doran Cemetery in Madrid, St. Lawrence County NY. 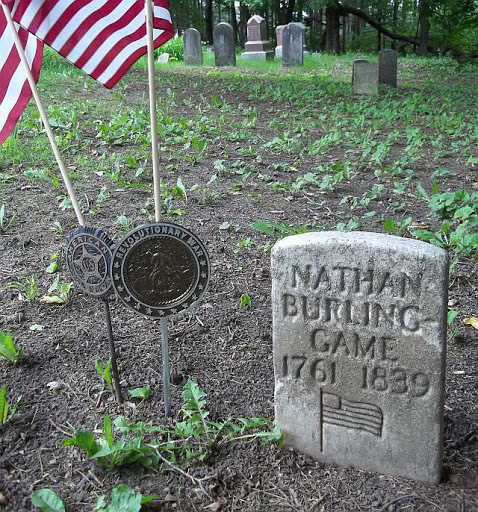 Nathan Burlingame was born February 1761 in Stamford CT and died 15 June 1839 in Lisbon, St. Lawrence County NY. According to the DAR Mary Hill was his second wife, first wife unknown. Mary was born in 1762 in MA and married Nathan 8 August 1791 in Lanesborough, Berkshire County MA. Her death date is unknown and she does not appear to be in the Doran Cemetery with him. Nathan resided in Gloucester, Providence County RI during the war and served in RI under Capt Thomas Hughes, Col Jeremiah Olney, and under Cpt Jeremiah Clark on the Guard Ship Polly. For his service he was granted Pension # SR1468V. Another photo appears on FAG but not on Anne Cady. Photos of the gravesites of Private Ephraim Samuel Hyde, DAR Ancestor #A061622 FAG# 27194179, and his wife Rebecca Hurlburt Hyde, in the Greenwood Cemetery, Morristown, St. Lawrence County NY. Ephraim Hyde was born 29 October 1762 in Stratford, Fairfield County CT, and died 3 May 1836 in Morristown, St. Lawrence County NY. He resided in Manchester, Bennington County VT during the Revolutionary War and served in VT under Capt Daniel Comstock and Col Samuel Fletcher. For his service he was awarded pension # SW19850. 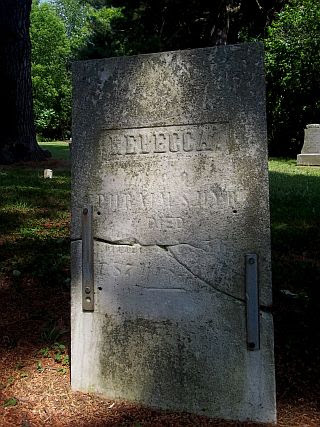 Rebecca died 1856, age 87 years, in Morristown NY and is buried right next to her husband. Note the DAR has her death date as post 1840. Other photos appear on FAG and Anne Cady websites. 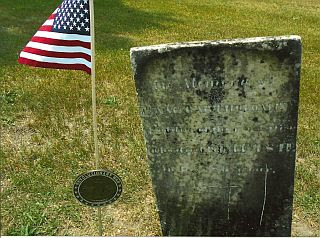 Photo of tombstone of Revolutionary War Patriot Pvt. 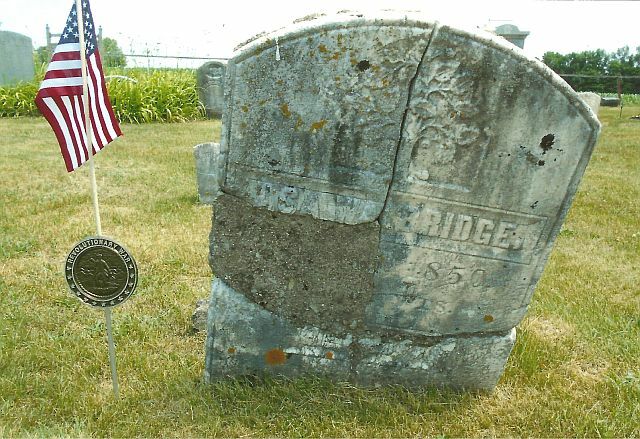 Asa Walbridge, DAR Patriot Index #A120598, in the Union Cemetery, Waddington/St. Lawrence County/NY. The DAR database shows that he was born 12 Oct 1766 in Bennington/Albany County/NY and died in Madrid/St. Lawrence County/NY on 15 Jan 1850. He resided in Bennington, Bennington County VT during the war and served in VT under Capt. Safford and Col. Walbridge. He was married to Relief Dickenson on 12 Oct 1786. She was born about 1766. The headstone has been broken and patched making it difficult to be sure of other information about her. Findagrave memorial # 25660552. Also found on Anne Cady’s site. Grave marked by Marlene Liscum Watson, Swe-kat-si Chapter NSDAR. 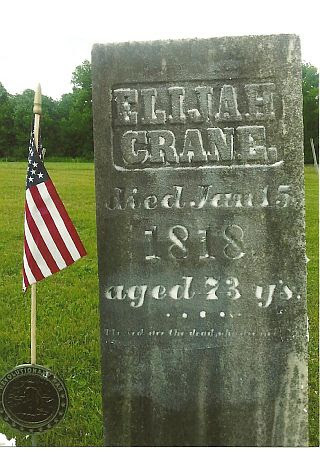 Photo of tombstone of Revolutionary War Patriot Corporal Elijah Crane, DAR Patriot Index #A027399, in the Chamberlain Corners Cemetery, Waddington/St. Lawrence County/NY. The DAR database shows that he was born 22 Feb 1746 in Lebanon/Windham County/CT and died in Madrid/St. Lawrence County/NY on 15 Jan 1818. He resided in Washington, Berkshire County MA during the war and served in MA under Lt. Jabez Cornish and Capts. David Noble and John Strong, and under Col. John Brown. He was married to Sarah Hill in 1770. According to the DAR, she was born in 1749 in Woburn MA and died in Canton NY on 11 Sep 1819. Her tombstone shows 10 Sep as date of death. Findagrave memorial # 29109065. Also found on Anne Cady’s site. 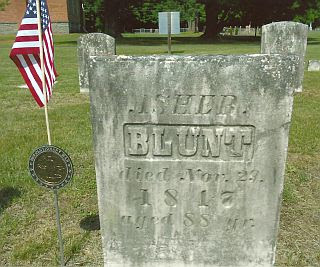 Photo of tombstone of Revolutionary War Patriot Private Asher Blunt, DAR Patriot Index #A011486, in the Louisville Landing Cemetery, Louisville/St. Lawrence/NY. The DAR database shows that he was born 22 Jan 1759 in Norwich CT and died in Louisville/St. Lawrence County/NY on 29 November 1847. He resided in Norwich CT during the Revolution. He served in CT under Col. Selden and Capts. Belcher and Kinney. For his service he was awarded pension # S29016. The DAR Index has him listed as Asher Blount. He was married to Sarah Gates in 1779. According to the DAR, she was born in 1762 in and died on 18 Aug 1825. 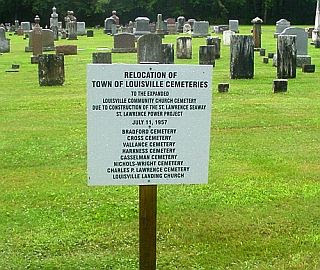 The Louisville Landing Cemetery was one of many cemeteries that were relocated in the 1950s to allow construction of the St. Lawrence Seaway and St. Lawrence Power Project. Findagrave memorial # 30174233. 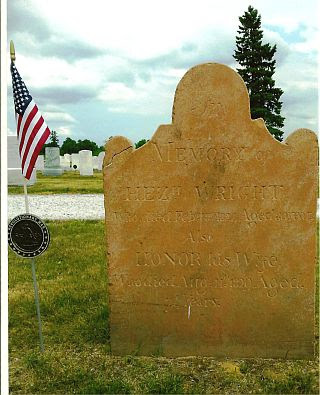 Photo of tombstone of Revolutionary War Patriot Corporal Hezekiah Wright, DAR Patriot Index #A130811, in the Old Brookside Cemetery, Waddington/St. Lawrence/NY. The DAR database shows that he was born 8 Jul 1744 in Glastonbury CT and died in Waddington NY on 18 Feb 1824. He served in MA under Capt. Samuel Wolcott. He was married to Honour Stratton on 10 Mar 1776 in Glastonbury CT. She was born about 1758 in Glastonbury CT and died on 11 Aug 1829 in Waddington NY. Findagrave memorial # 48378506. Also found on Anne Cady’s site. 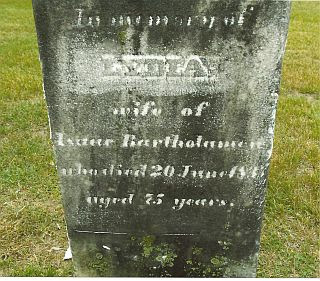 Photo of tombstone of Revolutionary War Patriot Corporal Isaac Bartholomew, DAR Patriot Index #A006898, in the Union Cemetery, Waddington/St. Lawrence County/NY. The DAR database shows that he was born 2 Jun 1761 in Farmington/Hartford County/CT and died in Madrid/St. Lawrence County/NY on 11 Feb 1841. He lived in Farmington, Hartford County CT during the war and served in CT under Capt. Stanton, Col. Elisha Sheldon, 2nd Regt, Light Dragoons. For his service he was awarded pension # S44590. He was married to Lydia Deming Crampton in 1784. According to the DAR index, she was born 22 Sep 1760 in Saybrook CT and died 30 Jun 1835 in Waddington NY. 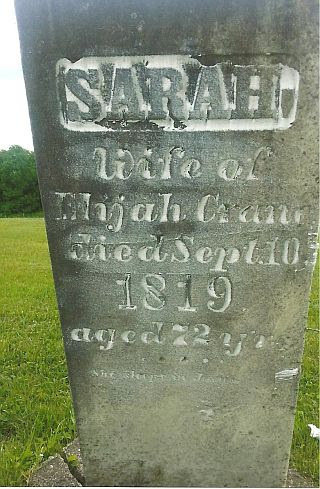 Her headstone shows that she died on 20 Jun 1835. Findagrave memorial # 25660173. Also found on Anne Cady’s site. 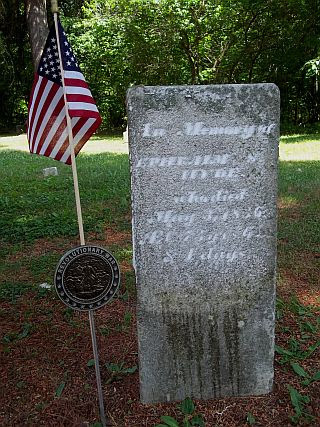 Photo of tombstone of Revolutionary War Patriot Pvt. 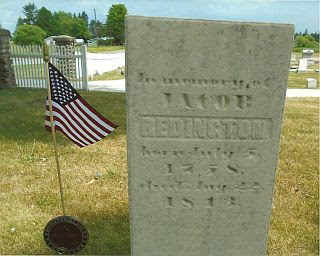 Jacob Redington, DAR Patriot Index #A094155, in the Old Brookside Cemetery, Waddington/St. Lawrence/NY. 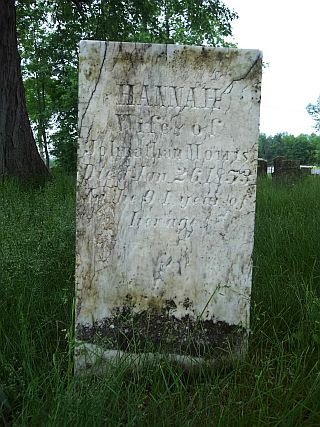 The DAR database shows that he was born 4 Jul 1759 in Tolland CT and died in Waddington NY on 22 Aug 1843.His gravestone says he was born 5 July 1758. He served in MA in the 6th, 10th and 17th Rgmts. He was married to Eunice King on 17 Nov 1785. She died 15 Oct 1847 and is also buried in Waddington. Findagrave memorial # 48377941. Photo also found on Anne Cady’s site. 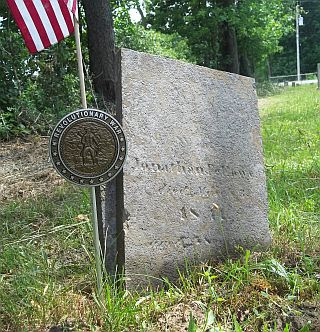 Photo of tombstone of Revolutionary War Patriot Pvt. Joseph Edsall, DAR Patriot Index #A036461, in the Old Brookside Cemetery, Waddington/St. Lawrence County/NY. The DAR database shows that he was born in 1763 in Vernon/Sussex County/NJ and died in Waddington/St. Lawrence County/NY on 26 May 1844. He resided and served in Sussex County NJ during the war. Under the description of Joseph’s service, his spouse is shown as (1) Sophia X. No further information is given regarding Sophia. In the associated application, his (1st) wife is identified as Anna who was born in 1791 and died on 3 Dec 1827. The DAR database shows he married Anna in September 1819. Findagrave memorial # 48377158. Photo of the grave site of Private Jonathan Fellows, DAR Patriot Index # A038868 FAG# 25533225, in the East Road Cemetery, DePeyster St. Lawrence County NY. Jonathan Fellows was born 18 October 1762 in Hawke, Rockingham County NH, and died 3 March 1841 in DePeyster NY. He resided in Hawke NH during the Revolutionary War and served in NH under Capt Piper and Col Reed. For his service he was awarded Pension # S10657. He was married to Eleanor Weeks but she does not appear to be buried with him. Other photos appear on FAG and Anne Cady websites. Photos of the gravesites of Private Isaac Mitchell, DAR Patriot # A080526 FAG# 25531275, and his wife, Jane Moore, in the Red Mills Cemetery, Lisbon St. Lawrence County NY. Isaac Mitchell was born in April 1761 in Peterboro NH and died 14 October 1848 in Lisbon NY. His wife, Jane Moore, died in Lisbon NY on 25 December 1856 in her 94th year. They were married in Salem, Washington County NY on 8 January 1785. Isaac resided in Peterboro NH during the war and served under Cpts Townsend and Farwell and under Cols Reed and Cilley. For his service he was awarded Pension # SW24150. Other photos appear on FAG and Anne Cady websites. BR /> Grave site marked by Jennifer Baird Bixby, Swe-kat-si Chapter NSDAR. Nathan Ford (1)/Foard (2), Revolutionary War Patriot of Morristown, Morris County NJ, served as a Clerk (1,2) and Assistant Deputy Quartermaster (3) during the war. He was born 8 December 1763 in Morristown, Morris County NJ (5) and baptized 8 February 1764 (5), the son of John and Martha Raynor Ford (5). He died 29 March 1829 (3,6)/29 April 1829 (5,) in Morristown, St. Lawrence County NY (6), and is buried in the Ford Family Vault on Lincoln Avenue in Ogdensburg NY with 19 members of the Ford family. Nathan Ford chose the location for this vault and designed it himself a couple of years before his death. Nathan Ford was a pioneer and founder of Ogdensburg NY and served as the First Judge in the Court of Common Pleas (3), from 1802-1820. He never married (4,6). Other photos appear on Anne Cady and FAG (#45710355) websites. Seth Ranney, Revolutionary War Patriot, served as a Private (1) in CT and NY in 1779 under Captain Brooks, Col. Berry and Col. Whitney. During the war he resided in Middletown, Middlesex County CT (1). He was born 21 January 1761 in Cromwell, Middlesex County CT (2) and baptized 22 February 1761 (3), the son of Willett and Mary Butler Ranney (2,3,6,8). His father, Willett Ranney, DAR Patriot Index # A094457, also served in the war (5). Seth married Eleanor Mathews who was born c. 1763 and died 12 March 1813 in the 50th year of her age (4,5,8). Seth died 1834 (1,7)/21 July 1839 (4) in the 78th year of his age. They resided in the Town of Oswegatchie, St. Lawrence County, NY (1) for many years and are both buried in the Ogdensburg Cemetery (4), St. Lawrence County NY. Other photos appear on FAG (#27400357) and Anne Cady websites. Samuel Walice (1,2))/Wallice (2) /Wallis (3,4,6,7,)/Wallace (5,8,9,), Revolutionary War Patriot of Douglas, Worcester County MA, served as a Private in 1775, MA, in Captain Bartholomew Woodbury's Company, Col. Lernad's Regiment, and Captain Reuben Davis's Company, Col. Luke Drury's Regiment ,also, Captain John Dodge's Company, Col Pickering's Regiment (1,2). Samuel was born at Douglas, Worcester County MA., 1 August (2,3) 1753 (3) 1755 (2), and died 4 March 1848 (5) 1850 (1) at Lisbon, St. Lawrence County NY (2,5) the son of John, Jr., and Elizabeth (3,4) Pond (4) Wallis (3,4). He married Sarah Dodge (5). The 1790 U. S. Federal Census, Douglas, Worcester County MA, listed Samuel Wallis with 7 household members (6), and in the 1810 U. S. Federal Census at Douglas, Samuel Wallis was head of the household with a total of 12 residents (7). At the time the 1820 U. S. Federal Census was enumerated at Stamford, Bennington County VT, 15 members were listed in Samuel Wallace's home (8). According to the 1840 U. S. Federal Census, Lisbon, St. Lawrence County NY, Samuel Wallace was born ca. 1760, with a total of three residents in the household (9). It is not known where Samuel and his wife are buried; although some speculate they are in the White Church Cemetery in Lisbon NY no stones have been found for them. No photos of their gravesites exist. 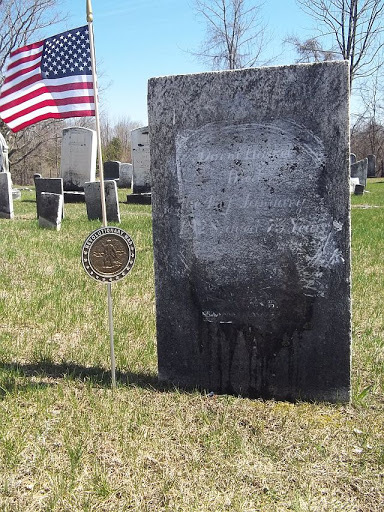 Reuben Turner, Revolutionary War Patriot of Salem, Washington County NY, served in NY as a Private in April 1775 under Captain Lee, Lieutenant Moses Martin (1), Adjutant (1,2) under Major Thomas Armstrong's Regiment of Militia of the County of Charlotte , Col. John Williams (2). Reuben was born in 1742 in Pelham, Northampton County MA (1), and died 8 July 1831 (1,4) 93 yr of his age (4) , the son of Alexander and Mary McConkey Turner (3) . He was buried in Red Mills Cemetery, Lisbon, St. Lawrence County NY (4). Reuben married Jane Armstrong on 24 August 1775 at Salem, Washington County NY (1,3). Jane died 4 September 1842 at Lisbon, St. Lawrence County NY (1), the daughter of Robert and Mary Armstrong (3). At the time the 1790 U. S. Federal Census was enumerated in Salem, Washington County NY, Reuben was a resident with a total of 9 household members (5). In the 1810 U. S. Federal Census, Lisbon, St. Lawrence County NY, Ruben's household consisted of 4 members (6), and in the 1830 U.S. Federal Census, Lisbon, St. Lawrence County NY, Reuben was head of a household of three residents (7). Other photos appear on Anne Cady website and FAG # 25531315. Samuel Bristol, Revolutionary War Patriot of Sandgate, Bennington County, VT, enlisted in the Vermont Militia April 1775 under Captain Ebenezer Wallace's Company, Col. Brush's Vermont Regiment, also, Captain Jonathan Allen's Company, and in May 1776 served as a Private in Captain Richard Hurd's Company, Col. Ira Allen's Regiment, also, August 1778 Captain Lemuel Bradley's Company, Col. John William's Regiment (1,2). 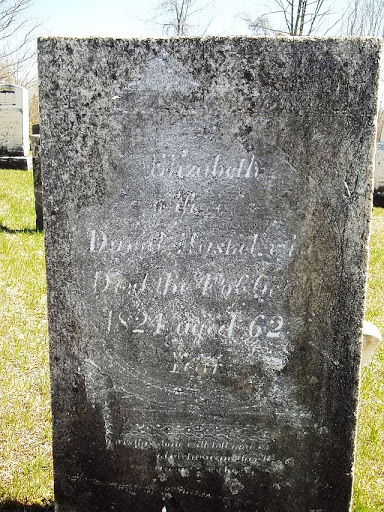 Samuel was born in January (3) 1757 in Newtown, Fairfield County, CT (1,3), and died on 2 August 1834 at DePeyster, Saint Lawrence County, NY (1), the son of Abraham and Mehetibel Nichols Bristol(3). The name of Samuel's wife is unknown. The 1790 U. S. Federal Census, Sandgate, Bennington County, VT, recorded Samuel Bristol as a resident with 7 members in his household (4). In 1810 Samuel Bristol was a resident of Dekalb, Saint Lawrence County , NY with 6 household members (5). At the time the 1830 U. S. Federal Census was done, Samuel Bristol was a resident of De Peyster, Saint Lawrence County, NY with a total of 9 residents in his household (6). According to Franklin Hough's A History of St. Lawrence and Franklin Counties, New York, the first settlement in the present town of DePeyster was made by Samuel Bristol, originally from Sandgate, VT (7). It is believed that Samuel Bristol is buried in the Todd Cemetery in DePeyster NY but that cemetery has been “lost” to posterity. Jubilee (1)/Jubicle (2)/Jubillia (3) A. Hurlburt (1,2)/Hurlbut (3) , Revolutionary War Patriot of Woodbury, Litchfield County, CT, Private, CT, enlisted in May 1780 under Captain William Moulton, Col. Seth Warner's Regiment, "taken prisoner by the British and Indians on 11 October 1780, Fort George, NY under the command of Major Carlton, and carried to Montreal in Canada - that I continued at Montreal as a prisoner until the month of October 1783 when I received permission to return home, I was ill and could not be moved at the time the other prisoners who were taken with me were sent by water to Halifax, which is the reason why I did not accompany them" (1). Moses Hurlburt (1,4) of the Town of Oswegatchie, Saint Lawrence County, NY(1) reported that he was the brother of Jubilee Hurlburt, and after the conclusion of the war, their father went to Canada to get his son (1). Jubilee was born ca. 1763 in CT, and died on 14 September 1827 at Morristown, Saint Lawrence County, NY (1), the son of Adam and Rebecca Booth Hurlbut (sic) (3). He married Polly/Molly Osborne on 23 October 1788/89 at Watertown, Litchfield County , CT (1). She was born 18 August 1769 at Woodbury, Litchfield County, CT, the daughter of Nathan Osborne (1). According to the 1840 U. S. Federal Census, Gouverneur, Saint Lawrence County, NY, Polly Hulbert (sic) was a resident, born ca. 1768, age 62, and was receiving a pension (5). It is not known where Jubilee Hurlburt is buried but he is presumed to be buried in Morristown NY where he died. 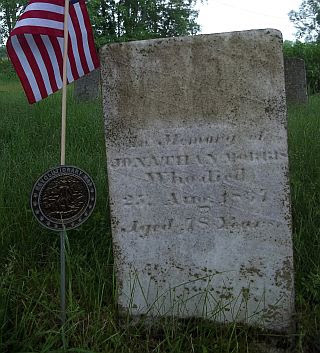 John Daniels, Revolutionary War Patriot of Westfield, Union County, NJ, enlisted in 1776 as a Private in the New Jersey Troops under Captain Amos Swan and Col. Heard, Courtland and Ford. He was in the battles of Flatbush and Springfield. He then removed to Orange County, NY, and drove teams under Captain Cummins for nine months, also, in June 1777 he served at Minisink, Orange County, NY, under Captain Cole and Col. Wisner and was in the battle of Minisink, and served in NY until 1783 (1). He was born ca. 1760 at Scotch Plains, Union County, NJ (1), and died 12 March 1847 at Canton, Saint Lawrence County, NY (1,2). He was buried in Jerusalem Cemetery, Canton, Saint Lawrence County, NY (2). He married Mrs.Thankful Gaylord Frisbie (1). She was born ca. 1775, and died August 1844 at Canton, Saint Lawrence County, NY (2) . Thankful was buried in Jerusalem Cemetery, Canton, Saint Lawrence County, NY (2). The 1835 U. S. Pension Roll recorded John as residing in Essex County, NY (3), and on the 1840 U. S. Pension Roll he is listed as a resident of Canton, Saint Lawrence County, N Y (4). According to the 1830 U. S. Federal Census, Lewis, Essex County, NY, there were 6 members in John Daniels household (5). The 1840 U. S. Federal Census, Canton, Saint Lawrence County, NY listed John Daniels as a resident, born ca. 1760 , age 80 years, Military Service, Veteran (6). Other photos appear on Anne Cady and Find a Grave # 26189049. Note that the stone has sunken further into the ground since those photos were taken. Hezekiah Tuttle, Revolutionary War Patriot of Williamstown, Berkshire County, MA, Private, Sergeant, Corporal, MA, under Captain Samuel Sloan's Company of Minutemen which marched in response to the Alarm of 19 April 1775, enlisted 22 April 1775, also, Captain Lemuel Stewart's Company, 10 May 1775 on expedition against Ticonderoga and Crown Point, also, Captain Abiathar Angel's Company, Col. David Brewer, also Captain John Wright's Company, Col. David Brewer's 9th. Regiment, 2 November 1775, also, Captain Samuel Clark, Col. Baley's Regiment , 20 January 1777, term 3 years, also, Sergeant, 6th Company, mustered between 20 January 1777 and 1 June 1778 by Truman Wheeler, Muster Master for Berkshire County, also served 13 months 9 days as Corporal, 22 months as Sergeant, also, Corporal under Captain Isaac Warren's 6th. Company, Col. Bailey's Regiment; company return dated Camp Valley Forge 24 January 1778 (1,2). Continental army pay accounts for service from 1 January 1780 to 22 January 1780 (1,2). Green Mountain Boys (2). Battles engaged in: Siege of Quebec, Bemis Heights, Stony Point (2) He was born on 1 (2)/ 10 (3) January 1755 in CT (2,3), and died 1 (8)/ 4 (2) May 1834 (2,8) at Canton, Saint Lawrence County, NY (2), the son of Ichabod and Sarah Prime Tuttle (3,4). He was buried in Olin Cemetery at Canton, Saint Lawrence County, NY (8).Hezekiah married Lucy Gould on 30 November 1791 at Clarendon , RutlandCounty, VT (2,3). She was born 18 April 1765 at Rindge, Cheshire County, NH (5,6), and died 8 January 1852 in St. Lawrence County, NY (8) , the daughter of Jacob and Elizabeth Hale Gould (5,6,7). 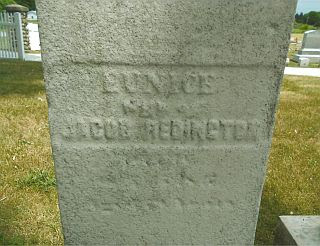 Lucy was buried in Olin Cemetery, Canton, Saint Lawrence County, NY (8). According to the 1820 U. S. Federal Census, Hinesburg, Chittenden County, VT, Hezekiah Tuttle was a resident with 4 members in his household (9).At the time the 1830 U. S. Federal Census was enumerated at Canton, Saint Lawrence County, NY, Hezekiah Tuttle was a resident, with 2 members in his household (10).Lucy Tuttle was age 85 years, ca. 1765, born in NH, and residing in the home of Caleb and Orvilla Olin at Canton, Saint Lawrence County, NY in 1850 , Dwelling #414, Family #435 (11). Other photos appear on Anne Cady and Find a Grave # 26155220. What a great project! You are preserving what might not be available to us in a few years. Good biographical notes and photos and you haven't forgotten the women who also sacrificed!